Voters in Lexington, Kentucky on Tuesday gave the OK for the city's openly gay vice-mayor to become Lexington's first openly gay mayor, the Washington Post reported. 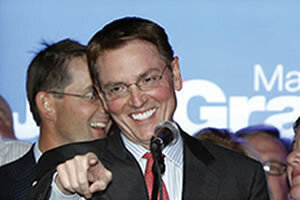 Jim Gray, president and CEO of Gray Construction Company – a nationally ranked engineering, design and construction company – defeated incumbent Jim Newberry in a non-partisan contest. The 57-year-old Gray enjoyed the endorsement of the Gay & Lesbian Victory Fund, a nationwide group that supports openly gay elected officials. According to his Victory Fund bio, Gray came out publicly in 2005, before being elected vice-mayor the next year. He is a graduate of Vanderbilt University. He's served as a trustee on the Board of Berea College and the KET Fund for Excellence, and in 1997 he was appointed a Loeb Fellow at Harvard University to study urban planning.